This page includes many German Shepherd puppy stories sent in by readers (adult German Shepherd stories are welcome here too, BTW). If you have ever had the opportunity to be owned by a GSD then you probably do have a few German Shepherd puppy Stories all your own. 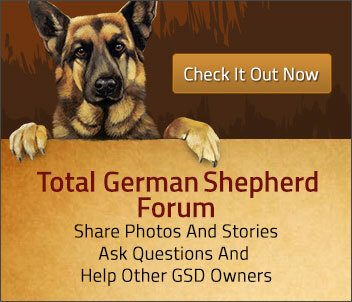 Here is your chance to share them with us if you'd like and to read those GSD stories submitted to us by others. These truly wonderful, incredibly smart and beautiful creatures are so full of personality that each and every one can easily fill your day with stories and adventures for some time to come. So, this is your chance to share a few of your stories with other German shepherd owners and those who haven't had the opportunity to be loved by a GSD. Below you'll find several reader submitted stories about their own experiences with their German Shepherd puppies and dogs. I hope you enjoy them all - and if you've got a story of your own to share, please send it in via our contact page. Ruger the Magnum Pup Just Passed his Canine Good Citizen Test!!!! Update on My German Shepherd Puppy, Ruger!!!! Our German Shepherd, Tucson, is an absolute love! I'm German Shepherd Keisel and I'm a Steelers Fan! The light of my life. My German Shepherds Yuffie and Diesel! 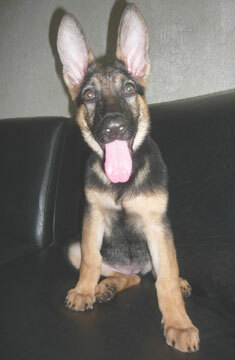 My german shepherd puppy Tiger - toooo cute to be punished! My old German Shepherd puppy, Shelbie. Looking forward to many adventures, almost 9 weeks old and 1st day home. My German Shepherd Puppy Babysits Our Jack Russell Puppies..
German Shepherd, Mr. Orr and Santa! Oh the Mighty Jakey German Shepherd Puppy! Our German Shepherd Puppy LOVES his frisbee! My German Shepherd Puppy, Romeo O' Romeo! I picked my GSD Puppy Raju because he was the "odd ball"
German Shepherd daddy saves one of his newborn pups. Do you have to teach your German Shepherd to protect you? Our New addition to the family. This is Dayton our 18 month old. The Story of GSD Snapper. Enjoy reading the great story of one readers German shepherd - a tough guy named Snapper. Sent in by Timothy Beedle.